The Hamilton Chamber of Commerce is launching another series of seminars to prepare businesses for light rail transit (LRT) construction. Chamber President Keanin Loomis says it is planning on the basis that the $1 billion, provincially-funded project will proceed as scheduled, despite ongoing political questions. The funding commitment was made by Ontario’s former Liberal government. There has been much speculation in recent months about whether the 14-kilometre LRT line between McMaster University and Eastgate Square will proceed under Premier Doug Ford’s new PC government. Some city councillors are second-guessing their support for LRT following Conservative leader Doug Ford’s announcement Hamilton can spend the $1 billion on other infrastructure projects if it rejects light rail. Lloyd Ferguson, heretofore a staunch LRT supporter, says Ford’s proposal is “very appealing” and will force him to rethink his position if the Conservatives form the government after the June 7 provincial election. Tom Jackson says he’ll also consider changing his vote if the Conservatives are elected. The east Mountain councillor says he ultimately backed LRT because he didn’t want to throw the $1 billion away by turning the project down. But Jackson says Ford’s proposal giving the city the option to spend the money on other transit and infrastructure projects dovetails with his own preference to spend it on the city’s transit fleet and upgrading roads, sidewalks and water mains. If, however, the Tories fail to win or form a minority government unable to follow through on Ford’s offer, Jackson says he’ll continue to support LRT to hold on to the $1 billion. The province’s transit agency is leaving the door open for Hamilton to run a planned new LRT line even as it urges council to abandon the idea. Months ago city council got on board with a local union campaign to ask the province to reconsider plans to contract out operations and maintenance of a $1-billion, 14-kilometre LRT line. The late request temporarily derailed plans by provincial transit agency Metrolinx to put out a tender call for consortiums to design, build, finance, run and maintain the project. It also left LRT supporters worried a contract award would be delayed beyond the Ontario election in June. But the city now has its answer: a reluctant yes — with plenty of warnings and a January decision deadline. In a Nov. 24 letter, Metrolinx president Phil Verster appeals to council to let the private tender process go ahead. Verster warned the HSR would be forced to shoulder a list of onerous responsibilities and legal obligations as part of a local operations agreement. 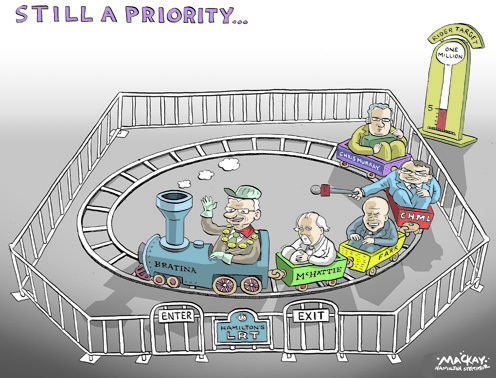 He also ruled out the idea of the city taking over responsibility for LRT maintenance. A companion report from city staff also identifies “immediate and ongoing costs” to the taxpayer if council commits to a locally run system — including $750,000 a year for the next seven years for a new five-person team dedicated to LRT operation matters. Those costs would not be covered by the $1-billion in provincial funding, the report says. Switching gears on LRT operations would also delay procurement by up to five months because Metrolinx would scrap a completed pre-qualification process for bidders and start again. Will Hamilton miss the bus on LRT operation? Will unreliable HSR bus service kill the city’s bid to operate light rail transit? It’s a popular question in the face of a dramatic spike in no-show buses — about 23 a day last month — unprecedented driver absenteeism and escalating tensions between the transit union and management. Two months ago, city council got on board with a vocal local union campaign to ask the province to reconsider its plan to contract out operations and maintenance of a $1-billion, 14-kilometre LRT line proposed for Hamilton. The province and transit agency Metrolinx, which had planned to solicit private bids to design, build and operate the LRT, say they are mulling the request. Mayor Fred Eisenberger said Thursday he expects an answer “in the next week or so,” but added he didn’t know if AWOL buses would factor into the provincial decision. Coun. Arlene Vanderbeek, however, publicly pointed out the especially poor timing of the no-show bus crisis. “We’ve asked the province to let us run the LRT … all of a sudden, we can’t run the HSR,” she said during a meeting on the issue at City Hall. Residents were quick to weigh in online, too. 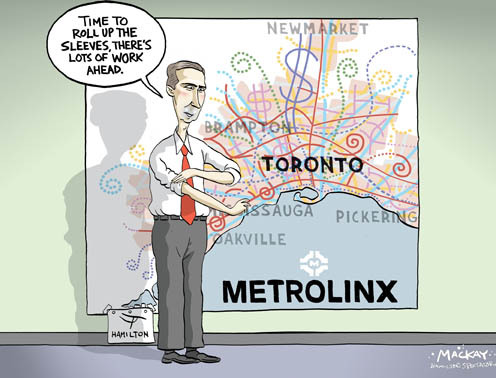 “Wonder how this debacle is playing down at Metrolinx HQ as they ponder council request to have @hsr operate the #LRT,” tweeted Ward 8 resident Paul Seczek. Brad Clark, the former Ward 9 councillor and a Tory transportation minister, also pointed to a “very problematic” open letter from the transit union that labels HSR management “incompetent.” “Province could seize on this letter as a reason to reject local operation or even stall LRT,” he said on Twitter.